We Are Opening for Our 50th Season! The park will be open Friday, April 19 – Sunday, April 28. Starting Wednesday, May 22, the park will be open from 10 am – 5 pm. Please check the calendar below for dates and times of special events. *Please note that our Summer animals, including Clifford, our giraffe, the camels, and lemurs are still vacationing in Florida until May, but our Spring season is still a blast! Spring guests will be able to meet our newest babies, including chicks, ducklings and kid goats! Also, guests will be able to take advantage of our reduced admission prices and smaller crowds! All rides and shops close 30 minutes prior to park closing. Times are subject to change without notice. Park admission is non-refundable. Rainchecks are issued at the discretion of park management. This schedule is updated monthly. All events are held at the specified animal’s enclosure, and are animal and weather permitting. Zookeeper talks are held daily at various animal habitats, including at the Nursery, the foxes and the wallaby, giving visitors a chance to interact with members of the animal care staff and learn about the animals. This calendar is subject to change. After all, there are humans and animals involved! Please check with our Admissions staff when you arrive at the zoo to verify the day’s events. Save $2 off regular admission! This offer cannot be combined with any other coupon. General Admission does not include ride and encounter tickets. These may be purchased in the Gift Shop. All prices are subject to change without notice. Park admission is non-refundable. Rain checks are issued at the discretion of park management. For $160 (plus tax), you get a Family Fun Pack Pass, good for 12 individual general admissions. This can be used by adults, children and seniors! Each time an admission is used, we will punch a hole in your pass. You can use up all 12 admissions by bringing your friends and family in one day, or you can use them throughout the season! 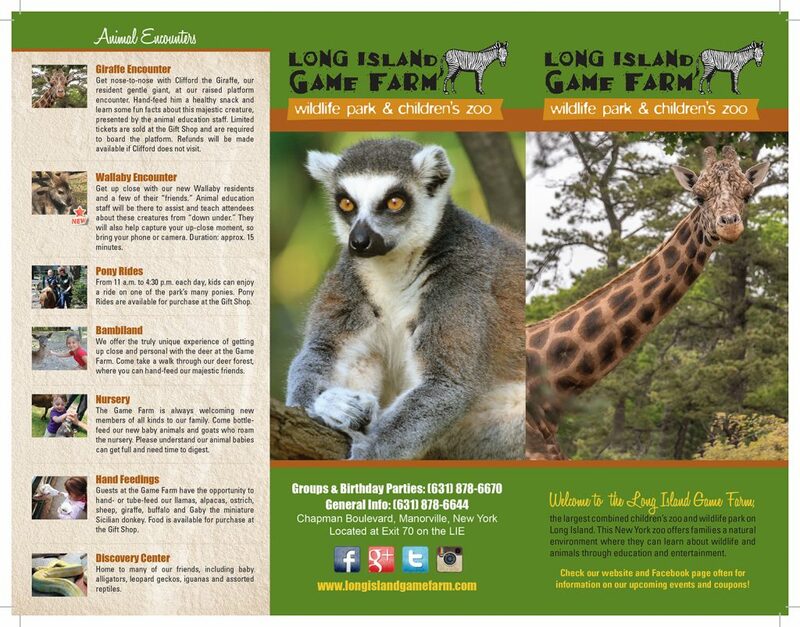 Family Fun Packs can be purchased at the ticket booth, the day of your visit, as well as purchased by phone: 631-878-6670. Gift Certificates are also available! From admission and pony rides, to animal encounters and souvenirs, you can build a gift certificate package that’s perfect for your loved ones. All customers must contact us by phone or email to request these gifts – please make sure to include all contact details. Credit Cards will be processed via phone. Family Fun Pack Passes DO NOT expire. Do Not Lose the Family Fun Pack Pass; you will need it to redeem any remaining admissions. Family Fun Pack Passes DO NOT include rides or animal food. 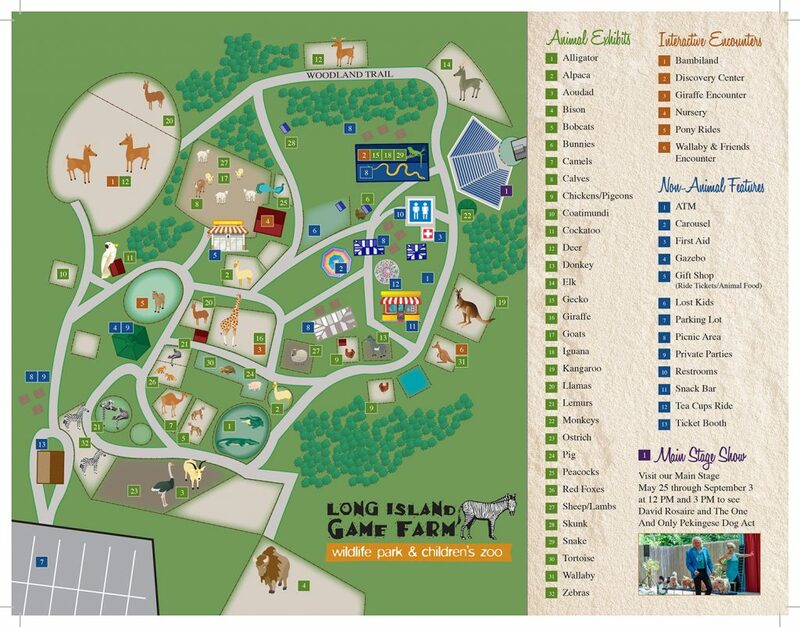 Every Thursday is Senior Day at the Long Island Game Farm! From May to October, if we’re open on a Thursday, Senior Citizens, age 62 and older, will receive FREE admission to the park with the purchase of one full-price child or adult ticket (cannot be combined with other discounts or coupons). This is the perfect way to get access to fun for the whole family, or for Grandma or Grandpa to spend some one-on-one time with the kiddos.